Orion, the hunter of the night sky is easily recognizable to many. As the Moon reaches its last quarter on its path to becoming a new Moon, it also reaching its furthest distance from the Earth. Our only satellite will rise late in the night sky, thereby barely causing a distraction to observation – a fantastic time to mention the constellation. 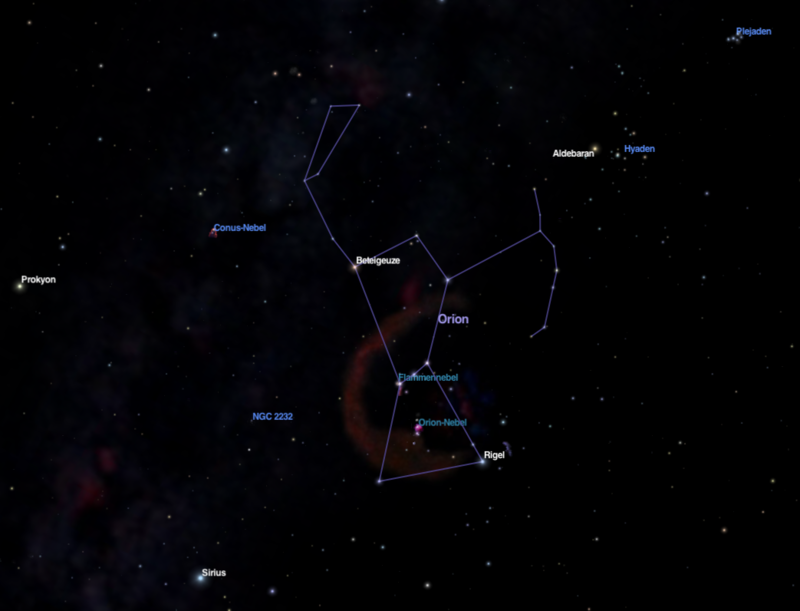 The constellation Orion can be found towards the south in the evening sky. With its bright stars, it is truly noticeable and with a minutia of imagination, you can make out the human figure in it. The star found on Orion’s shoulder, Betelgeuse, will appear as a warm orange, while Rigel, the star at the knee of the hunter, shines blue. One of the most attractive features of the Orion is without a doubt the Orion Nebula M42 – a giant gas cloud and birthplace of stars. If you have excellent eyesight, you should be able to identify the nebula. For those, who need help in finding Orion and its nebula, can use their Universe2go and subsequently receive a wealth of information on the constellations background. The second half of the night belongs to the Moon and Jupiter. Early birds will definitely enjoy with the naked eye the high visibility of many planets lined up in elliptical fashion across the night sky. This sight will be especially delightful on Monday morning, the 1st of February. Then the waxing Moon, the planet Mars and the star Alpha-Librae can be found close together, providing an wonderful opportunity for astro-photographers. 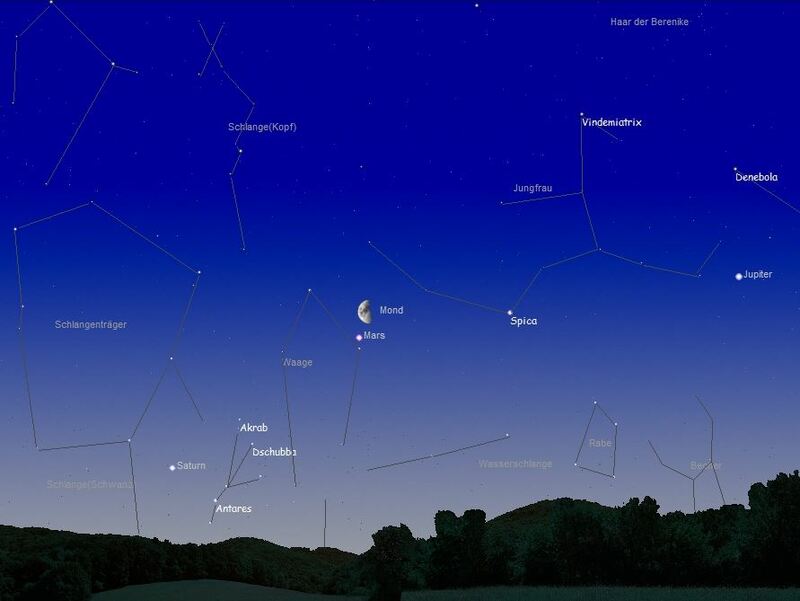 In the graphic – generated with the Software Clear Sky 1.0 – is a look south at the night sky on the morning of February 1st at around 6 AM. Depending on your position on Earth, the Moon may appear with Mars in the middle of the constellation Libra. Jupiter can be seen further west from this position and Saturn has already risen along with the constellation Scorpion, while Venus and Mercury will follow. The view from a higher elevation to the horizon would be assuredly advantageous. If you would like to impress your friends, casually mention that Alpha-Librae also has the beautiful name Zubenelgenubi.